U.S. EPA may impose fines on four of China’s biggest makers. 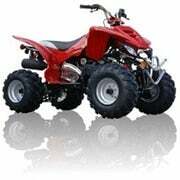 This is the first time EPA has voided certificates of conformity for off-road or all-terrain vehicles. The U.S. Environmental Protection Agency (EPA) today withdrew its approval of the import and sale of 200,000 gas-powered off-road motorcycles and all-terrain vehicles from China. The agency alleges that tailpipe emissions information was either incomplete or falsified entirely. It is just the latest action that casts doubt on the quality or safety of Chinese products or the integrity of the firms that produce them. This is the first time EPA has voided certificates of conformity for off-road or all-terrain vehicles. Moreover, it is only the second time the agency has done so for any type of vehicle. EPA says it is considering an enforcement action under the Clean Air Act, which could lead to “significant financial penalties” against the businesses that manufactured or imported these types of recreational vehicles. The amount is still under consideration, an EPA official told me. The revocation comes as the Obama Administration is desperately trying to prevent the U.S. Congress from introducing bills on reforming the Chinese Yuan or Renminbi (RMB), long an undervalued currency, which allows cheep Chinese goods to displace U.S. made ones. In an election year, and given the ongoing Great Recession, such bills – if introduced – will find widespread non-partisan support, and complicate the U.S.’s relationship with China, which holds large amounts of U.S. Treasury debt. Back in May, EPA fined Pep Boys $5 million for importing non-compliant motorcycles, recreational vehicles and generators manufactured in China. (See Pep Boys Fined $5 Million for Clean Air Violations) More than 35 different Chinese manufacturers were building illegal vehicles and engines in that case. In the latest case of the Chinese flouting U.S. law, EPA issued certificates in 2006 and 2007 to the U.S. counterparts of four of China’s largest manufacturers including Hensim USA (City of Industry, Calif.), Loncin USA (Hayward, Calif.), Peace Industry Group (Norcross, Ga.), and Seaseng (Pomona, Calif.). 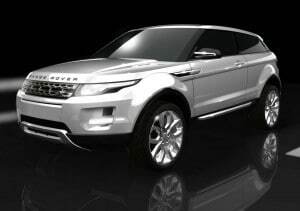 Launch to mark Range Rover’s 40th anniversary. A 2009 rendering of the LRX. Look for some changes -- and a new name -- as Land Rover's first front-drive crossover debuts late this year, with a hybrid version to follow by 2013. There’ll be more than just a birthday cake to help Land Rover celebrate the 40th anniversary of its flagship Range Rover tomorrow, a bouncing baby brother that’s been making the rounds, in concept form, as the LRX. Lower, sleeker and decidedly more crossover-like, the compact Range Rover that’s due to a formal unveiling could take the British-based marque into a new era, one where car-based crossovers have come to dominate traditional, truck-like sport-utility vehicles on the sales charts. Similar to the concept vehicle Land Rover has been promoting on the auto show circuit for several years, the production version of the LRX boasts a less boxy appearance, with a more sloping honeycomb grille, pinched headlights, and a roofline that appears to taper towards the rear hatch. The show car – along with a number of heavily camouflaged prototypes seen in recent months – sported a two-door configuration, but a 4-door is also reportedly under development. Don’t expect to see the show car’s LRX name to carry over into production, various sources report, though the actual moniker will be tightly held until a global webcast launch from Land Rover headquarters in the U.K. Thursday afternoon. Projections continue to point toward an ongoing decline. Weakness in new-vehicle retail sales experienced during the first half of June has progressed at an accelerated rate through the remainder of the month, pulling the retail selling rate below 8.5 million units, according to J.D. Power and Associates. Power had originally projected that new-vehicle retail sales were expected to come in at 768,000 units, which represents a seasonally adjusted annualized rate (SAAR) of just 8.6 million units. Final results from AutoData Corporation will be in late tomorrow. The difference amounts to about half of the annual output of a typical final assembly plant, not counting the negative effects on production of component parts, such as engines and transmissions at supporting plants. Thus, the Global Great Recession continues as the U.S. Congress grapples with a bill to regulate the reckless practices of Wall Street, which crippled the global economy in the fall of 2008. Republicans oppose the bill. Is EV maker the next Apple? 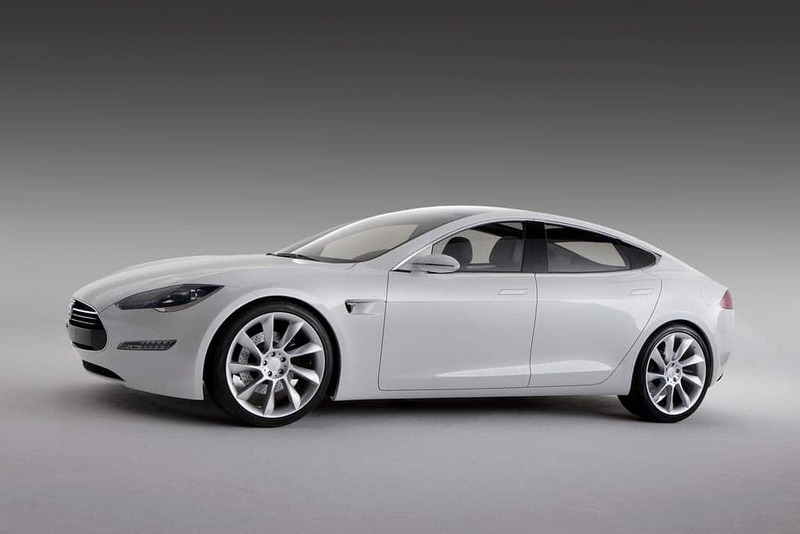 Now Wall Street has plenty riding on the Tesla Model S, too. The first new automotive IPO in a half-century was greeted by the sort of exuberance seldom seen on Wall Street, these days, as investors charged in to grab shares of the California electric-vehicle manufacturer, Tesla Motors. Despite a last-minute move to raise the opening price of its stock to $17, while also substantially upping the number of shares being offered, investors plugged in and were clearly turned on. By the time the first day of trading ended, Tesla had jumped 40.5%, to $23.89. And the upward momentum is continuing. By midday Wednesday, shares had nudged past $28, another 20% gain. The initial public offering netted Tesla $226.1 million for 13.3 million shares. The company had originally planned to put 11.1 million shares on the market – representing 12% of its equity – at a price range of $14 to $16. (Click Here for more.) The news is particularly good for Tesla founder Elon Musk, who has invested a large chunk of his personal fortune, derived from his stake in the online financial service PayPal. In recent weeks, Musk, who is going through a bitter divorce, let it be known that he is now broke. Production set to stop on once popular Chrysler PT Cruiser. Going for its last cruise. 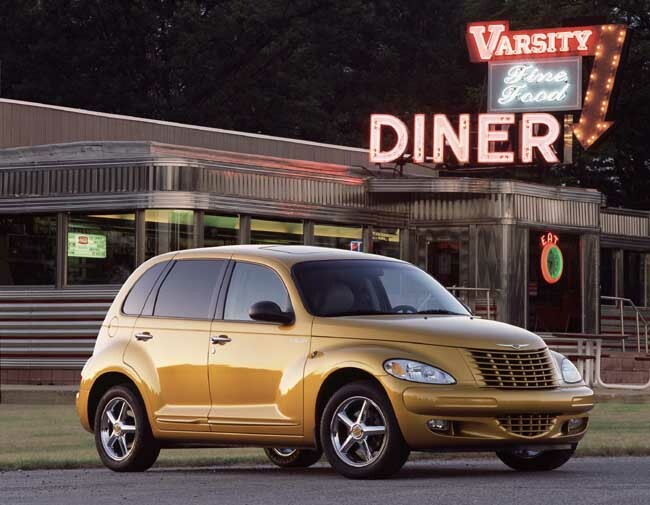 The once wildly popular PT Cruiser ends its production run on July 9. Its debut at the 2000 North American International Auto Show touched off a near-riot when Chrysler began handing out die cast models. And in its first few years on the market, the automaker could barely keep up with production. But shortly after the Independence Day break, a car once described as “too cool to categorize” will fade into oblivion, the last one set to roll down the line on July 9. 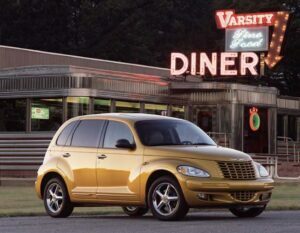 Exactly why the Chrysler PT Cruiser is going out of production is as much a matter of debate as the reasons for its early success, though there’s no arguing the fact that sales are a shadow of their one-time peak, when the Detroit maker could barely keep up with demand. Short for Personal Transportation, the Cruiser was one of the first domestic models to fall into the nebulous crossover category. Even federal regulators had a hard time figuring out whether to call it a car or truck for safety and fuel economy standards. Smaller by a foot than the old Dodge Neon sedan, its high seating and large cargo compartment were part of the appeal, but there was also a sort of back-to-the-future element to the design, former Chrysler officials suggested. “The styling gets you into the vehicle, but the utility keeps you there,” one-time PT Cruiser Marketing Manager Jay Kughie told TheDetroitBureau at the vehicle’s launch. Retiree Medical Benefits Trust to get $3.8 billion. Happier days for all back in 2007. Ford Motor Company (NYSE:F) today is reducing its debt by more than $4 billion by retiring debt owed to the UAW Retiree Medical Benefits Trust ahead of schedule. The company said it is taking the action to strengthen its balance sheet. Analysts have noted that although Ford escaped bankruptcy during the Global Great Recession, it still has a relatively large amount of debt. Nonetheless, Ford says it will post a profit and positive automotive operating-related cash flow this year, which means the stock price could be caught in forces beyond Ford’s control. Ford is making scheduled payments in cash totaling about $860 million on Notes A and B held by the UAW Retiree Medical Benefits Trust – including about $250 million due under Note A, and $610 million due under Note B. Ford had the option to pay Note B with cash or Ford stock but agreed to pay with cash. In addition, Ford and its subsidiary, Ford Motor Credit Company, are paying a combined $2.9 billion to retire the remaining obligation on Note A at an agreed upon discount of 2%. Separately, Ford is making a $255 million cash payment to bring current previously deferred quarterly distributions on the 6.50% Cumulative Trust Preferred Securities of Ford Motor Company Capital Trust II. With today’s actions and an April payment of $3 billion on its 2013 revolving credit facility, Ford will have reduced its debt by more than $7 billion in the second quarter. The second quarter debt reduction will save Ford more than $470 million in annual interest expense. “We expect to continue to improve our balance sheet as we deliver on our plan,” said Ford President and CEO Alan Mulally. “Importantly, our business results make it possible to take these actions while still accelerating the investments we are making in our business to serve our customers with the very best cars and trucks,” Mulally claimed. It is mostly a rehash of previously available info as a run up to an impending IPO. But two key things emerged for taxpayers. The man whose product development team will ultimately pay back the taxpayer debtors? 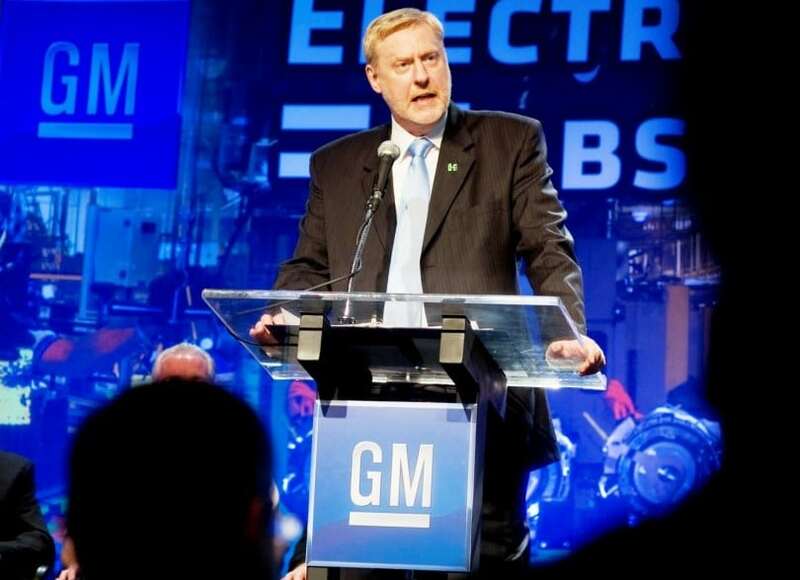 General Motors Company today hosted a group of 200 members of the financial community and other stakeholders during a Global Business Conference at its Technical Center in Warren, Michigan. 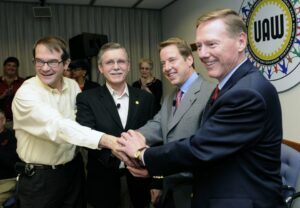 The event was the first of its kind since the debut of the new company in July 2009 when it emerged from bankruptcy as a taxpayer-owned private firm and former ATT telephone executive Ed Whitacre took over as Chairman. The conference had all the appearances of a hastily arrange public relations event that was likely constrained in content by an impending filing with the U.S. Securities and Exchange Commission to take the taxpayer held company public. Once GM files, it will be subject to a “blackout period” on such events until its public offering is complete – a process that is largely outside of GM’s control. Such a filing could come as early as next month when second quarter earnings become available, which the best companies do within weeks of closing, if not sooner. GM had revenue of $31.5 billion and operating income of $1.2 billion during the first quarter of 2010. GM’s net income attributable to common stockholders was $865 million, resulting in earnings per share on a diluted basis of $1.66. It was the first quarterly profit at the company since 2007, and a necessary prelude to an initial public offering or IPO. The conference featured a review of GM’s global business, with updates by Chairman and CEO Ed Whitacre, Vice Chairman Steve Girsky, Vice Chairman and CFO, Chris Liddell, and GM’s regional presidents. Vice Chairman of Global Product Operations Tom Stephens provided a review of GM’s global product portfolio, and an early preview of some upcoming products, including the next versions of the Opel Insignia, Chevrolet Malibu, and Cadillac CTS. Most of it was boilerplate and platitudes, which if bottled could prove to be a great benefit to insomniacs. A less desirable sort of “independence” is happening on roads. Is the U.S. distracted by politics from what really works in preventing highway deaths? As the United States celebrates Independence Day, an average of 148 people die in motor vehicle crashes each year – far above the daily average. An analysis of Federal fatal crash data shows that July 4, August 13, July 15, and January 1 were the days with most crash deaths during 2004-2008. That compares with 114 deaths that occurred on the average day, according to the Insurance Institute for Highway Safety. “Why do we tolerate so many highway deaths?” asks Adrian Lund, president of the independent Institute. In Lund’s view, it is not that U.S. society has become unconcerned about motor vehicle crashes. Rather the U.S. emphasizes the wrong aspects of the threat, while ignoring many proven ways to reduce deaths and injuries on the highway. For example, Lund notes that Congress held extensive public hearings on the Toyota safety defects, even though the risk to millions of Toyota drivers is statistically small. On the other hand, speeding is a factor in one-third of all highway deaths. Lund points out that instead, Congress repealed the national maximum speed limit in 1995. Since then state after state has raised speed limits on many roads, costing thousands of lives. A petition to require controls to cap the top speed of large commercial trucks has languished for three years. Meanwhile, distracted driving and cell phone use behind the wheel are getting all the attention. With much fanfare, states are enacting bans targeting various aspects of phone use by drivers, especially texting. Yet, according to Lund, there is little evidence that the laws will work. Demand for stock in loss-making EV firm greater than expected. Initial stock offering closes up 40% from the asking price. Tesla Motors founder Elon Musk at the Detroit Auto Show, January 2009. Tesla Motors, Inc. (Nasdaq:TSLA), a manufacturer of electric vehicles and electric powertrain components, today announced its initial public offering of 13.3 million shares of its common stock at a price to the public of $17 per share. Tesla originally said it hoped to sell 11.1 million shares of stock, equal to 12% of the company, at a price range of $14 to $16. The increase reflects anticipated demand from investors hoping to cash in on electric vehicles. Tesla shares began trading at $19 a share this morning on the NASDAQ Global Select Market. Of the shares in the IPO, the company is offering 11,880,600 shares and 1,419,400 shares are being offered by selling stockholders. It closed at $23.89 – up more than 40% from the $17 asking price. In addition, the selling stockholders have granted the underwriters a 30-day option to purchase up to an additional aggregate of 1,995,000 shares of common stock to cover over-allotments, if any. 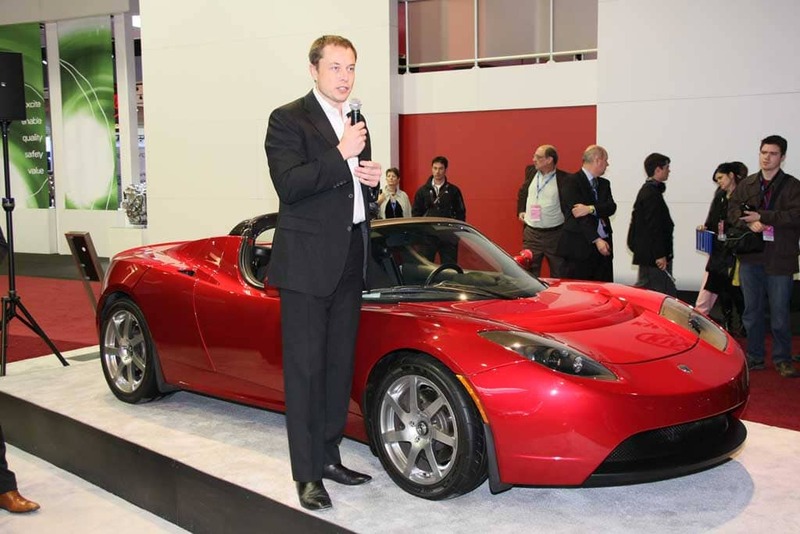 Tesla will not receive any proceeds from the sale of shares by the selling stockholders. Goldman, Sachs & Co., Morgan Stanley, J.P. Morgan and Deutsche Bank Securities are acting as the joint book-running managers for the offering. Tesla’s move to go public is the first IPO by a U.S. automaker in half a century, since Ford Motor in 1956. Analysts say a number of other electric vehicle manufacturers could enter the market if Tesla’s bid proves successful. EVs will be heavily subsidized by taxpayers under current legislation. And where Tesla’s stock will be trading a month from now as the hype subsides is questionable. IPO not on the agenda – but it will be on everyone’s mind. His TV commercials haven't been a big hit. 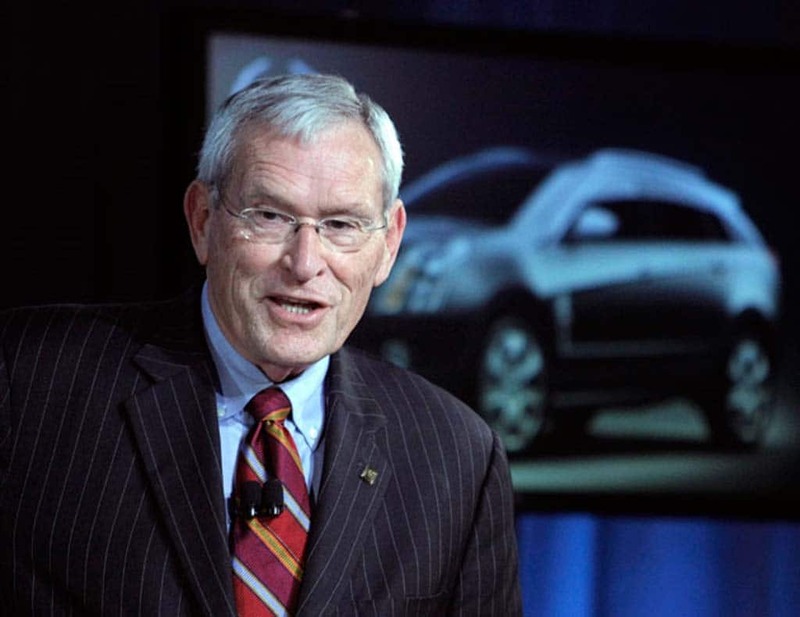 Will GM CEO Ed Whitacre's presentation to potential investors do any better? When General Motors CEO Ed Whitacre kicks off a meeting with 200 key members of the financial community, this morning, he’ll be sidestepping what, for most of those on hand, would likely be the most important topic of all: when will the automaker stage its much-anticipated Initial Public Offering. To date, Whitacre has only said that GM will become a public company once again when the time is right. But there’s little doubt he’s under significant pressure from the White House, which would like to get back as much of the federal bailout money pumped into the company last year – and as soon as possible. But sources at GM say the topic of an IPO will be specifically off the table, even as Whitacre, GM Chief Financial Officer Chris Liddell and the rest of the top management team give potential investors a look at what has happened since the automaker emerged from bankruptcy nearly a year ago. The session is intended to cover a broad array of topics about the way the “new” GM has been reorganized, about the way its finances are shaping up, how it is expanding its global base and how it is reviving its long-troubled product operations, the latter topic a subject for global product operations chief and Vice Chairman Tom Stephens. This will be CFO Liddell’s first big event since joining General Motors early this year. He previously served a similar role with Microsoft and, like CEO Whitacre, had no previous automotive experience. Liddell will address a broad range of topics, according to organizers, but the numbers will be key to many on hand, said various sources who were planning to attend in person or dial in over a conference line. Among the questions he and others may be asked is how GM plans to weather the apparent slowdown in car sales in recent weeks. More long-term, the executive team could be asked to give a sense of who will be in charge once Whitacre retires. The former ATT chairman has openly acknowledged his initial reluctance to take on the GM job and has hinted he probably won’t stay on long after an IPO. While Whitacre’s comments, in recent months, have suggested an IPO could be pushed back into 2011, many in the investment community believe that GM will bow to pressure and make it happen prior to the upcoming national election.